“About Marriage: the 357-day honeymoon” is a collection of writings by a Christian couple who went on a 357-day-long honeymoon to places like Yanbian, Cambodia and India. 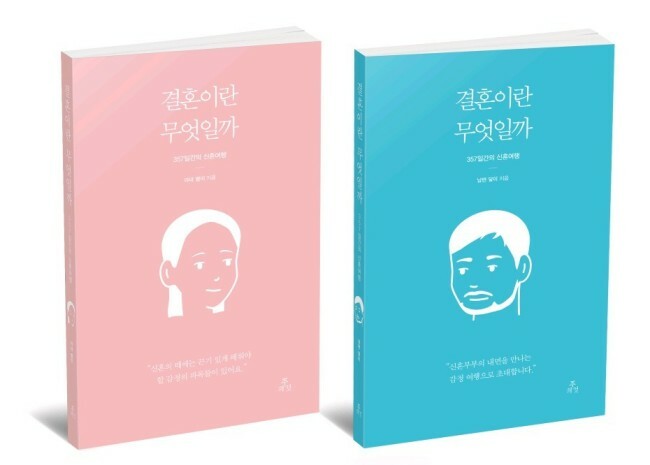 Like Japanese female writer Kaori Ekuni’s famous novel “Between Calm and Passion-Rosso,” “About Marriage” comes in two separate books, one written by the wife, Lee Sa-rang, and the other by the husband, Chung Chae-hun. Very different from Ekuni’s novel is that “About Marriage” is not romance fiction. “About Marriage” deals with the reality of being married rather than fantasizing about being together. The couple confess to small-to-large quibbles and the daily grind they had to bear, instead of sugarcoating their honeymoon with ultimate escapism and romantic moments. Instead of talking about their sightseeing trips, they talk more about the conversations they had together. “The yearlong honeymoon was an investment for our future,” the couple said in a press release. “You need to take out time to read a couple of books to prepare for a monthlong trip to Europe. How long would it take to prepare for marriage, a lifelong trip,” they continued. “We hope our books on our one-year honeymoon experience offer help to those who are preparing for their marriage and also those who just got married. This book is in Korean.